On the 11th hour of the 11th day of the 11th month in 1918 the armistice ending fighting in WWI, the war to end all wars, was signed. While the peace did not last, the date gained recognition throughout the western world. Originally, the date was marked as Armistice Day, but when the losses mounted in the many wars that followed, the name was changed to allow all soldiers from all wars to be honored. In Canada, as in the UK, November 11th is called Remembrance Day - in the U.S. it's Veterans Day this year celebrated on Sunday, November 11, 2018. Because Veterans Day falls on a Sunday this year, US banks and post offices will be closed on Monday, November 12, 2018 for the federal holiday. Schools that traditionally close for Veterans Day will also be closed on the following Monday. The Wall St. stock exchanges will remain open. As usual, watch in the US nationwide for restaurants to offer free meals and offers of retail discounts to veterans (with proper ID) in honor of the day, along with traditional 2018 Veterans Day sales through the weekend. Some of the best offers from restaurants for military members on Veteran’s Day include Dunkin' (formerly Dunkin' Donuts) with a free donut for military members. Wash it down at Starbucks, offering a free tall coffee on the 11th. For lunch, check out Little Caesar's between 11 a.m.-2 p.m. on the 11th for a free Hot-N-Ready lunch combo, which includes four slices of pepperoni pizza and a 20-ounce drink. Meanwhile, Red Lobster is offering either a free appetizer or desert on both November 11 and 12 to anyone with a valid military ID. 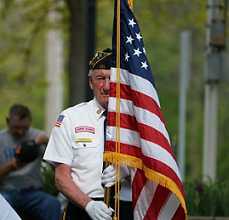 Veterans' Day is marked with neighborhood parades, ceremonies, quotes and speeches - and a moment of silence - to honor those men and women who have made the ultimate sacrifice for their nations in the two World Wars, Korea, Vietnam, the Falklands, Lebanon, Desert Storm, Afghanistan and Iraq. Dignitaries gather to place wreaths on the tombs of unknown soldiers who rest in anonymous honor as a symbol of all who gave the ultimate sacrifice for their country. In Flanders Fields Museum - Check out this excellent, interactive online exhibit with a "you-are-there" atmosphere describing what it was like behind the lines and in the trenches during World War I including a virtual tour, historical timeline and related resources. Veterans Day - The U.S. Department of Veterans Affairs offers a Washington D.C. schedule of events, classroom activities, downloadable posters and wallpaper, a related FAQ and complete Veterans Day Teacher Guide in PDF format. Today in History: November 11 - Here's a rich collection of World War I history resources from the U.S. Library of Congress including interviews and personal recollections, quotes and sound files of famous speeches and songs, recruitment posters, photographs and illustrations. Poetry for Veteran's Day - Good collection of poems commemorating the day including complete text for "In Flanders Fields", "I Have a Rendezvous With Death", "A Nation's Strength", and more. Soldiers Songs - Sing along with popular tunes that originated from World War I, World War II, and the Vietnam War with background histories, audio samples, and ordering info. Veterans' Day Graphics - Check out a nice collection of illustrations, cartoons, and Web graphics in honor of the day.